The solutions to ill-structured decision problems greatly rely upon the intuition and cognitive abilities of a decision maker because of the vague nature of such problems. To provide decision support for these problems, a decision support system (DSS) must be able to support a user’s cognitive abilities, as well as facilitate seamless communication of knowledge and cognition between itself and the user. This study develops a cognitive decision support system (CDSS) based on human-centric semantic de-biased associations (SDA) model to improve ill-structured decision support. The SDA model improves ill-structured decision support by refining a user’s cognition through reducing or eliminating bias and providing the user with validated domain knowledge. The use of semantics in the SDA model facilitates the natural representation of the user’s cognition, thus making the transfer of knowledge/cognition between the user and system a natural and effortless process. 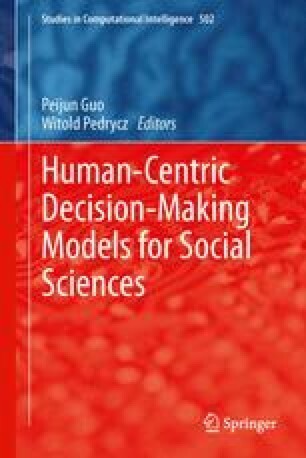 The potential of semantically defined cognition for effective ill-structured decision support is discussed from a human-centric perspective. The effectiveness of the approach is demonstrated with a case study in the domain of sales.